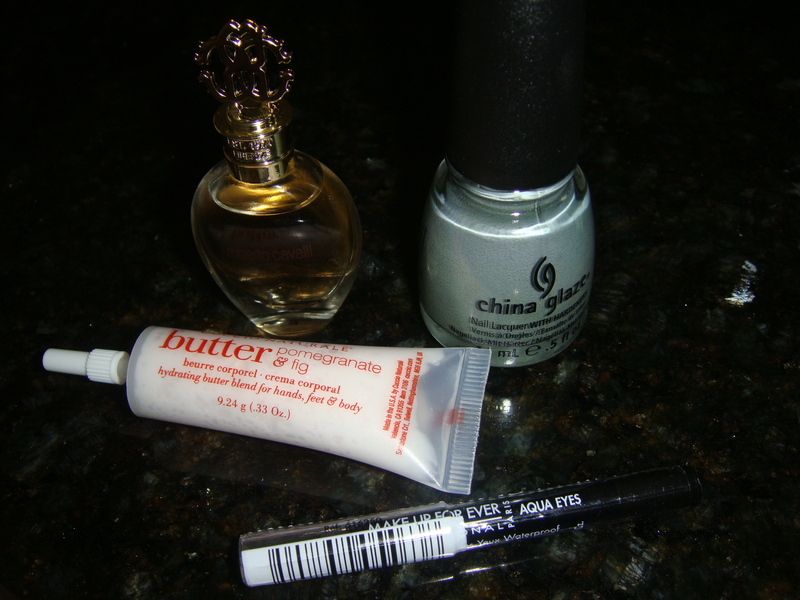 I’ve finally gotten around to sharing what I received in my Topbox this month. I haven’t been wowed by what I have received in these boxes for the past couple of months. Always hoping for the next month to be better. China Glaze Nail Polish in Elephant Walk – A lovely light greenish/grey colour with tiny flecks of blue. This one is from the Fall 2012 On Safari Collection and I’m excited to try this out. Cucio Naturale Butter Blend for Hands, Feet & Body in Pomegranate & Fig – A perfect hand cream to put in your purse and smells delightful too! MAKE UP FOR EVER Aqua Eyes in Black – I have previously received this in another beauty box and I remember trying it and not liking it as it smudged on me. However I will give it another try. Roberto Cavalli Deluxe Miniature Perfume – In the monthly feedback surveys, I checked off that I was allergic to perfume and hoped to not receive a perfume sample in my box. Needless to say, I was surprised to see this in there. The bottle is cute, but I would have preferred anything else, but perfume. I understand that this is the last box that has been billed for $10 and now Topbox has increased the price to $12 for December onwards. I am hoping that this increase means a better value and selection of samples. I can’t wait to see what will arrive in next month’s box and that will help me decide to continue my subscription or not.